Does a gunman cry? Does a battle hardened warrior show tears? With us, the answer is yes. In 1967 our troops liberated the Old City of Jerusalem. For the first time in many years Jews were able to reach the hallowed Western Wall, the 'Kotel ', and pray. Finally, after years of yearning, Jews could touch the sacred stones of The Wall, the last remnant of the destroyed Holy Temple of Jerusalem, and mourn its destruction. 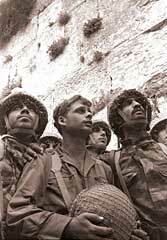 The Israeli paratroopers were the ones privileged to liberate the Wall, and the first to touch its stones. The poet Yosi Gamzu wrote, "There are men with hearts of stone, and there are stones with hearts of men." These ancient stones have hearts of men. And the brave, battle hardened warriors reached the Wall, and they wept. They wept for the Temple of Solomon, they wept for all Jews who for thousands of years prayed from their distant places of exile to return to this spot, this holy spot. They wept for the destruction and exile of Israel. And they wept tears of joy for having merited to behold this place with their own eyes, to feel it with their own hands and to be the messengers of the entire Jewish nation, past, present and future. A paratrooper stood at the wall; he may have remembered stories of a grandfather taken from his home, beaten, put in a cattle car and taken to a concentration camp where he was gassed and then put in an oven. And the Wall saw a brave paratrooper weep. For a thousand years this wall has absorbed the tears of the Jewish people. "There are men with hearts of stone and there are stones with hearts of men." An Israeli team of military experts are teaching the Polish army how to use advanced missiles. Only decades ago millions of Jews perished on this Polish soil. Today the Jews are back, in the form of the Israeli army, showing its power. Today the Jews are the military instructors. The rocket man, an Israeli who is the world expert on firing rockets, will do the shooting. He has fired hundreds of these and never missed, until today. Today he misses the target. What went wrong? Just before the firing, his colleague from Israel took out a bunch of photos; his family from Poland; Hasidic Jews with long beards, they were all killed here in Poland by the Nazis and their many helpers. The Israeli rocket man was so distraught that for the first and only time, he missed. It was written in the report as 'human error'. Human indeed, for the emotions that poured forth that day were deeply human, deeply Jewish. The supervisor took him aside and asked what had happened. "Did the photos affect you? Is it being here in Poland where so many of our people were brutally murdered?" The rocket man, the top gunman in the world, stood aside. He could not control his tears any longer. Does a gunman cry? Yes, indeed. He gained control of himself and the next shot was a bull's-eye; perfect.